It's June, so that means SoFAB's Kids Camp is starting up again! We kicked off this year's summer camp with a tour of the Southern states, starting with Louisiana on Monday. While Louisiana, and New Orleans especially, is known for its jambalaya, gumbo, and po'boys among numerous other foods, we wanted to try something a little different so we dug into our library's cookbooks to find traditional recipes for Dirty Rice along with Pickled Okra. Before we got into our cooking stations, though, we had each table come up with a team name and decorate a poster corresponding with the state we assigned them. We got to meet the Louisiana Dirty Rice Cookers, the West Virginia Mountain Men, the South Carolina Golden Islands, the Virginia Berry Awesome Baking Biscuits, and last, but not least, the Mississippi Beautiful BBQs. After that, we learned more about the different cultures that contributed to the gumbo Louisiana is known for. Each camper then made their own contribution to our hypothetical "camp gumbo". Some of our favorite additions were doughnuts, king cake, and crawfish! 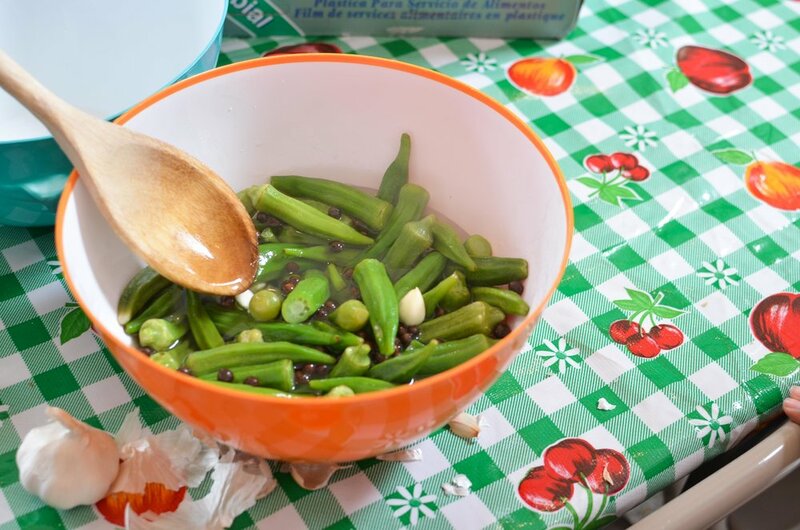 Then, we finally got into cooking, during which, we learned about safe chopping technique and the science behind pickling! Over all, it was a great first day and the dishes turned out great thanks to all the helping hands. On Tuesday, we jumped right into the day with dough-making. We did this to let the dough chill for at least thirty minutes before handling later. In those thirty minutes we got to learn about West Virginia’s wild game and then played a camp favorite - Snack Wars!! 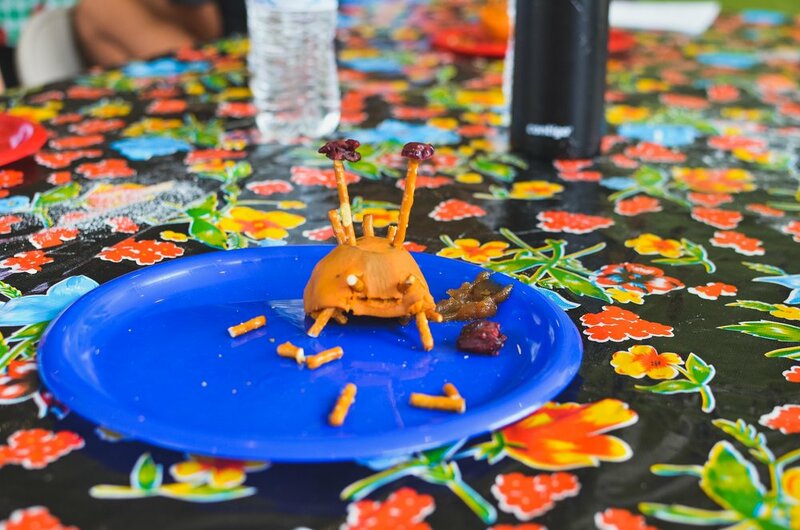 Each pair of campers was given some sweet potato, pretzels, cranberries, and a directive to dream up their own new kind of crazy wild animal. We asked them where their animal might live, what it might taste like, and most importantly, how they would cook it for a meal! The campers saw the sweet potato again in our cooking stations when we prepared Savory Sweet Potato Mash. We also pulled the dough back out of the fridge for our Venison Hand Pies. While the hand pies baked, the West Virginia Mountain Men helped get our space to restaurant-quality clean and set up for eating while the others played a couple rounds of Bayou Tag. We all met back up at the end to enjoy the finished products and talk about our favorite parts of the day. Another success! Wednesday marked the middle of the week at Kid's Camp, and we made the trek from the mountains of West Virginia to the eastern shores of South Carolina to explore the rich cultural and culinary traditions of South Carolina. The climate and geography of SC make tea one of the major agricultural products of the state. To celebrate this, the kids wrote letters to their friends and family members, then stained them with brewed tea to add an old-fashioned flare during craft time. The food for South Carolina originated from the Gullah People, an important group living in the Sea Islands and Lowcountry. In order to learn more about the food, history, culture, and language of the Gullah, the kids played a heated round of Jeopardy with the Brilliant BBQ’s emerging victorious. Next it was time for the campers to get their hands dirty and cook the shrimp and rice where they furiously chopped, mixed, measured, and stirred their way to a delicious meal. Freshly brewed iced tea with a simple syrup on the side complimented the dish. The Golden Islands were inside plating while the rest of the camp enjoyed a game of Chefs and Waiters. The food was delicious, the tea was cold, and it was a great day at Camp! On Thursday, we traveled a bit further north to explore the cuisine of Virginia. In honor of the Virginia ham, campers worked hard to fold and decorate origami pigs during craft time. The kids had to work together and communicate well to get the intricate folds just right. Next, campers explored the mysteries of three tasting stations, where they got to sample and guess foods with rich history in Virginia. The three mystery items turned out to be hominy, lima beans, and plums; hominy was a camp-wide stumper with many kids tasting it for the first time. The food for the day was a green tomato soup with ham for good flavor followed by a tasty blueberry hand pie. At the soup-making station, campers chopped ham, veggies, and lots and lots of tomatoes before getting experience with an immersion blender for a final smooth soup. Blueberries proved the perfect filling for the flaky dough used for the hand pies. Campers got experience reducing the fruit to a paste, rolling out the dough, and crimping together the assembled pies. Before eating, the kids enjoyed a game of Alligator’s Tail followed by Bayou Tag while the Berry Awesome Baking Biscuits stayed inside to plate. The soup was delightful, and the hand pies were a delicious golden brown. Campers left with full bellies and happy faces! To wrap up the Southern Tour, we headed a little further west to the state of Mississippi for an exploration of some classic cuisine. 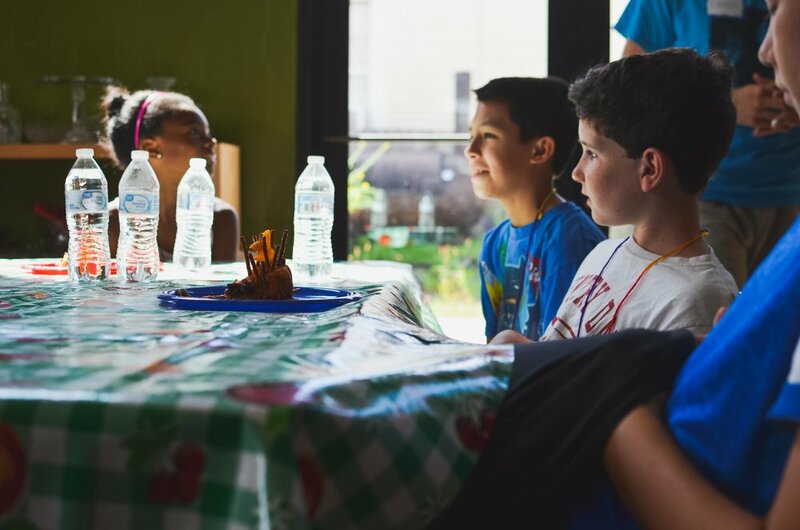 During craft time, campers constructed and decorated cookbooks containing all the recipes from the week. They collected signatures from their new friends and made sure to makes notes on each of the recipes about things they would add or substitute. The food for Mississippi originated from Mexico, originally brought there by migrant workers: the Mississippi Delta Tamale. Campers mixed the dough, stuffed the tamales, and wrapped the tamales in corn husks before steaming. As a last treat, the campers made Mississippi mud pie. While the tamales were steaming, everyone enjoyed a game of Chefs and Waiters and a game of Bayou Tag while the Brilliant BBQ’s plated inside. The tamales were perfectly seasoned, the mudpie was a cool treat after a hot game, and Kid’s Camp Week 1 was a great success!